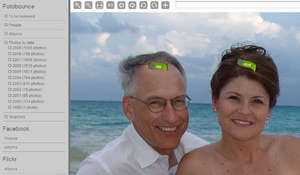 FotoBounce is a photo organizer produced in Burlington, Ontario. It can perform a variety of tasks not to mention the facial recognition technology which can help you better organize your photos and albums by tagging friends and family, a serious alternative to using facebook for all of your photo organizational needs. It includes support for various platforms like Android, Facebook, Flickr and more. The Android app is a separate download for browsing your albums from your wireless device. Version 3.9.9 is a freeware program which does not have restrictions and it's free so it doesn't cost anything. For security reasons, you should also check out the Fotobounce download at LO4D.com which includes virus and malware tests. Additional screenshots of this application download may be available, too. Fotobounce has a presence on social networks.